That's what you'll find at the new 1760 Pub'n Grille in Trexlertown. Enjoy traditional pub favorites like burgers and wings, but don't be afraid to try the grilled salmon; it's already developing a following. The 20 beers on tap will certainly keep the adults happy, and the arcade room featuring some of the latest interactive video games will keep the kids occupied. There are 32 televisions through out the facility, playing baseball and football games from across the country. Great place to grab a beer and watch a game. Love the appetizers - Wings, nachos, etc. Sweet and Sweaty Wings are the best. I always want to try the other flavors, but I always go back to my favorite. 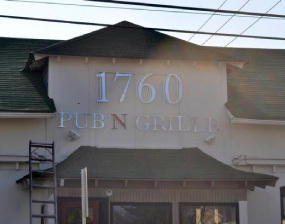 Be the first to review 1760 Pub & Grille!